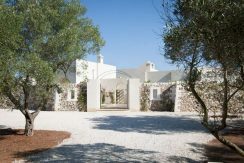 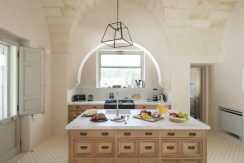 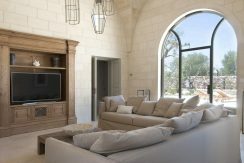 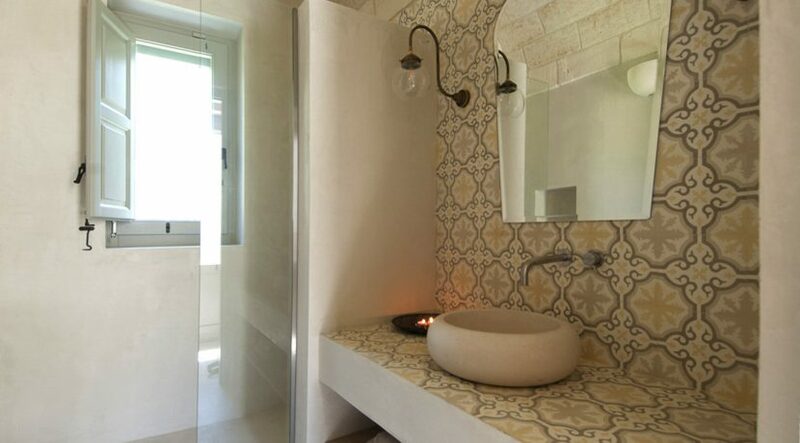 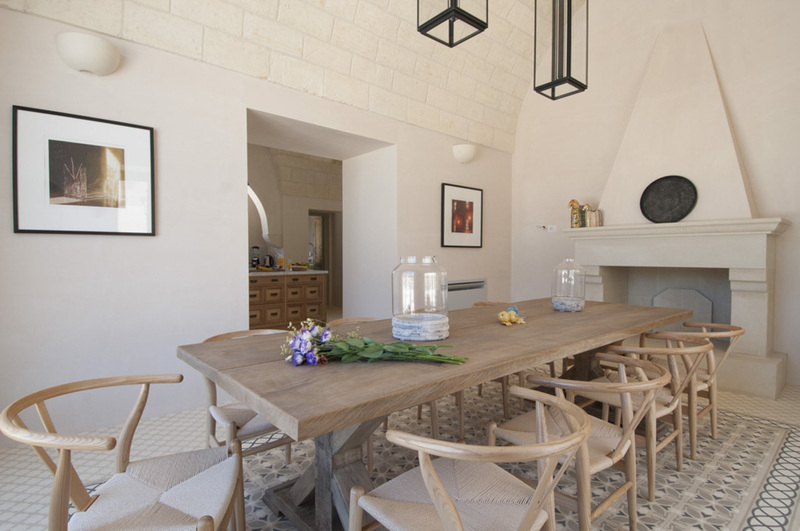 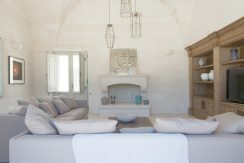 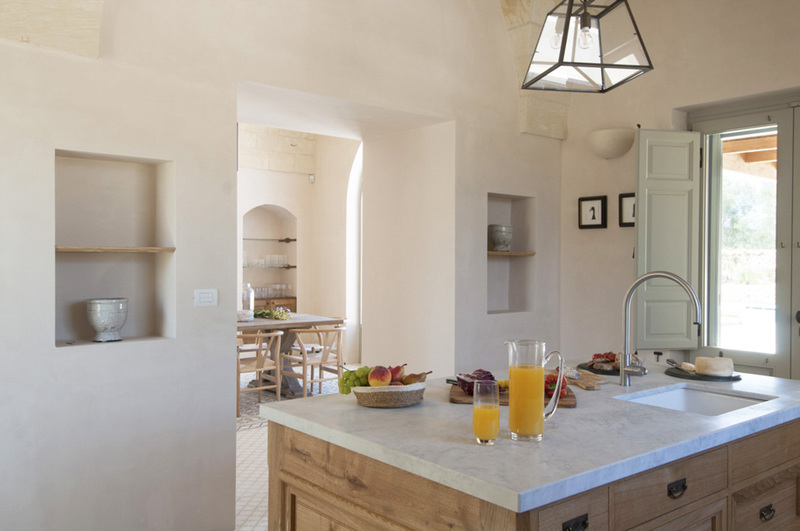 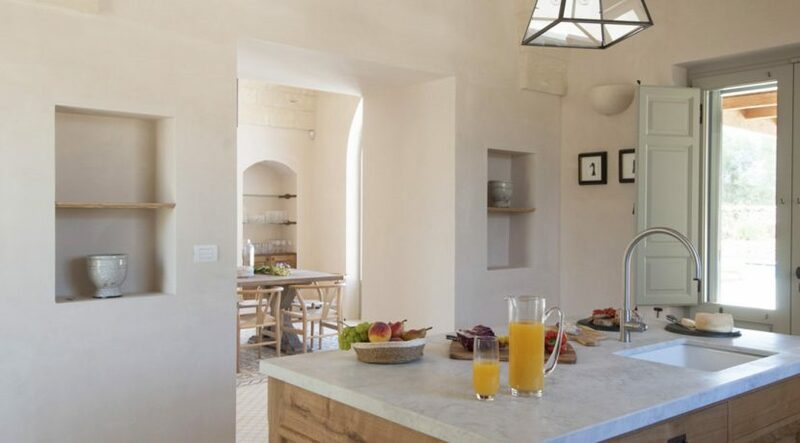 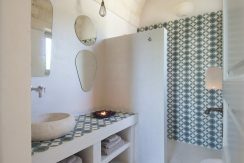 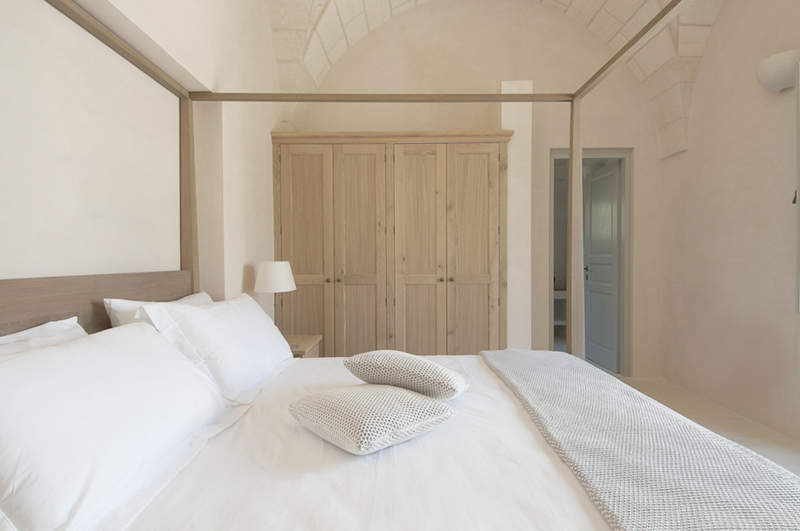 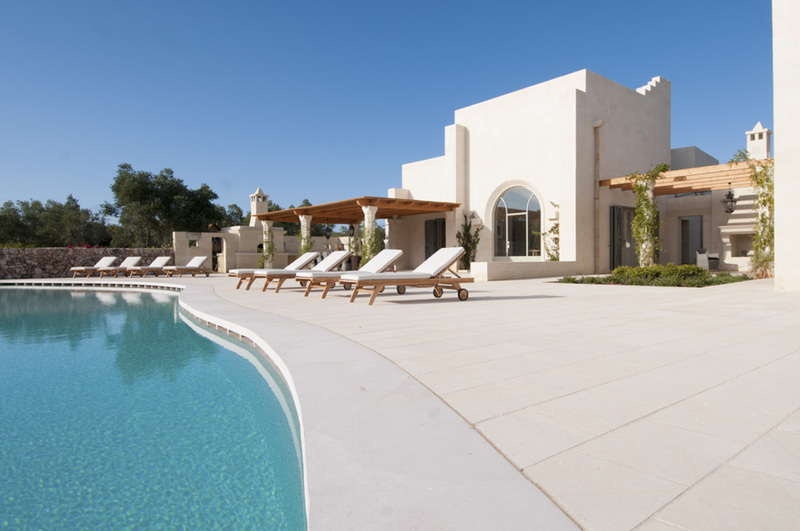 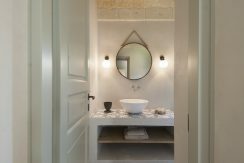 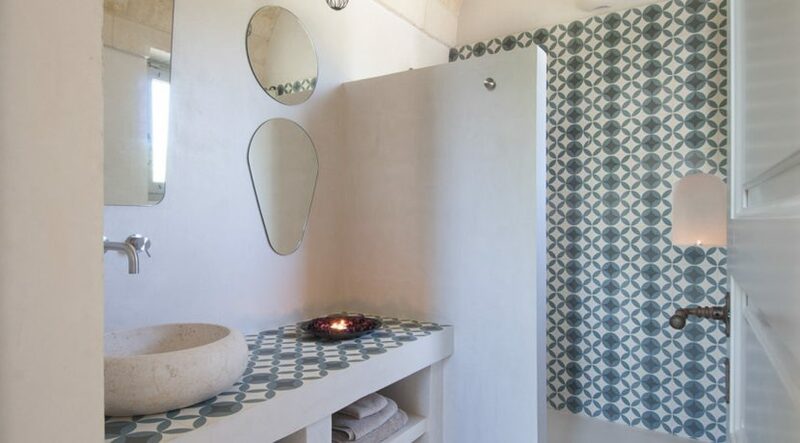 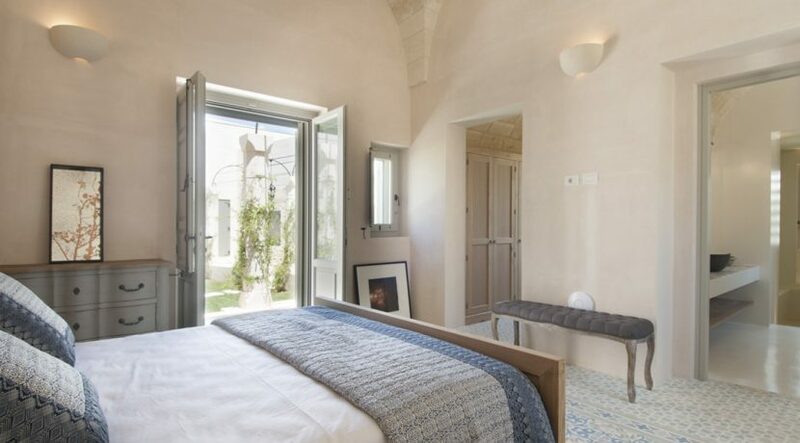 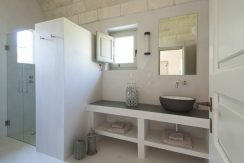 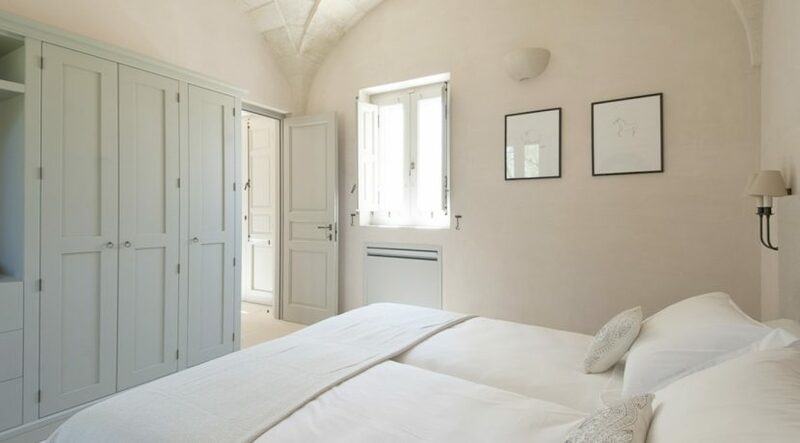 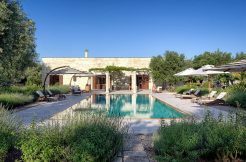 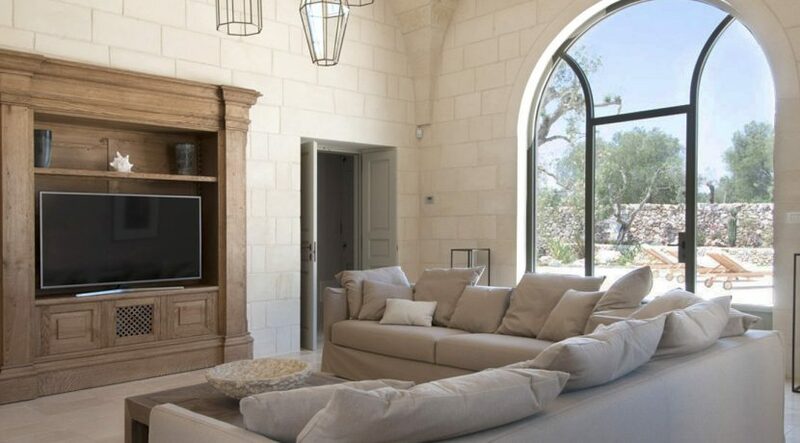 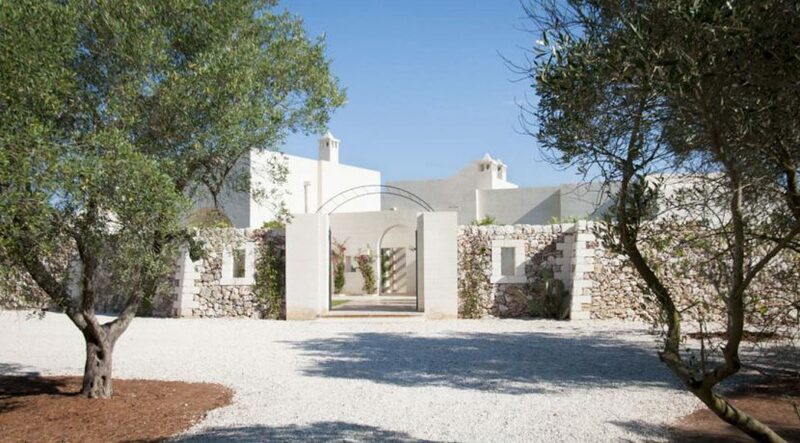 Masseria Campo dei Fiori is a luxury villa in the countryside of southern Puglia, set in a quiet 3 hectare grove featured by stunning olive trees. 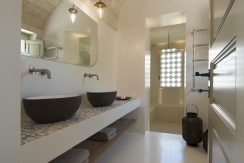 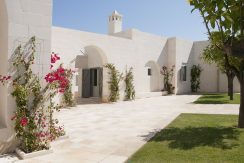 The design and construction concept of this villa focusses on blending very ancient techniques with modern technological expertise. 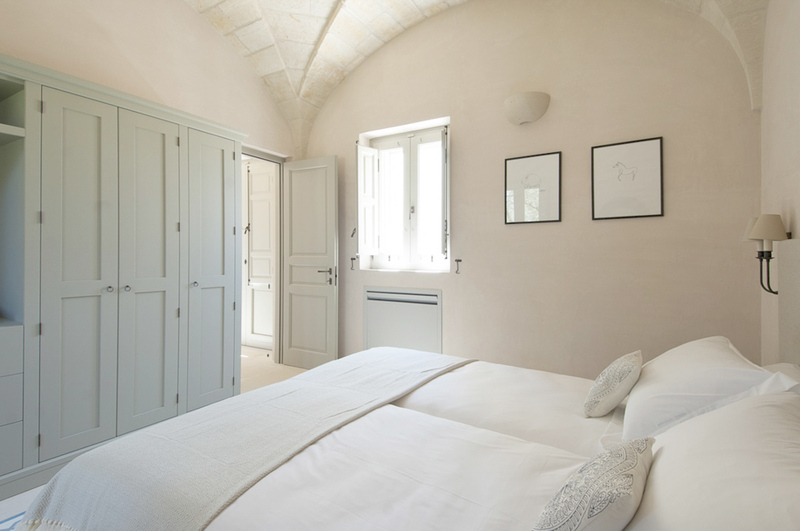 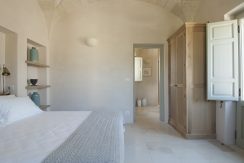 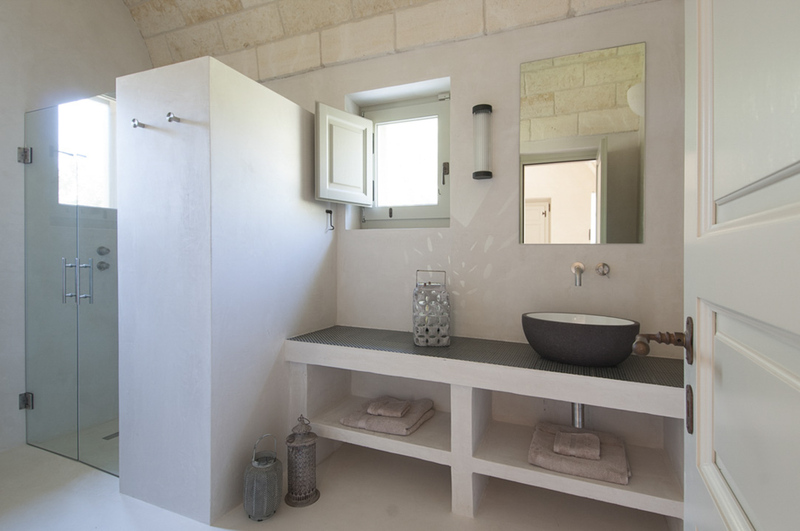 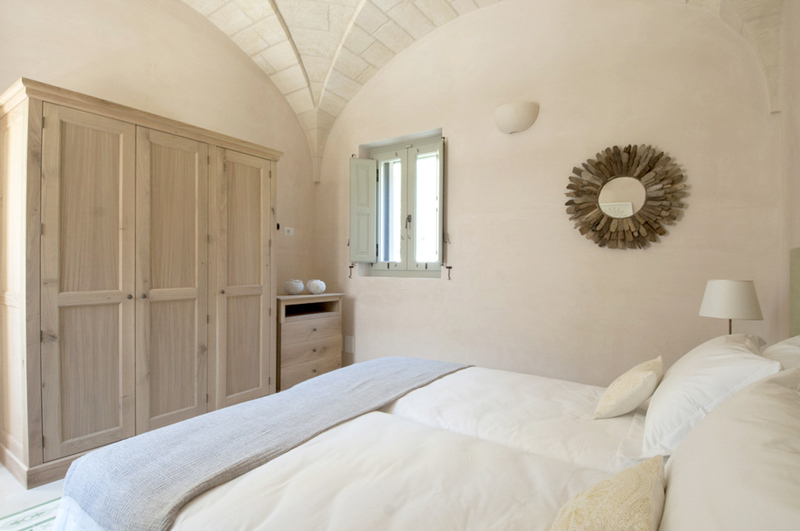 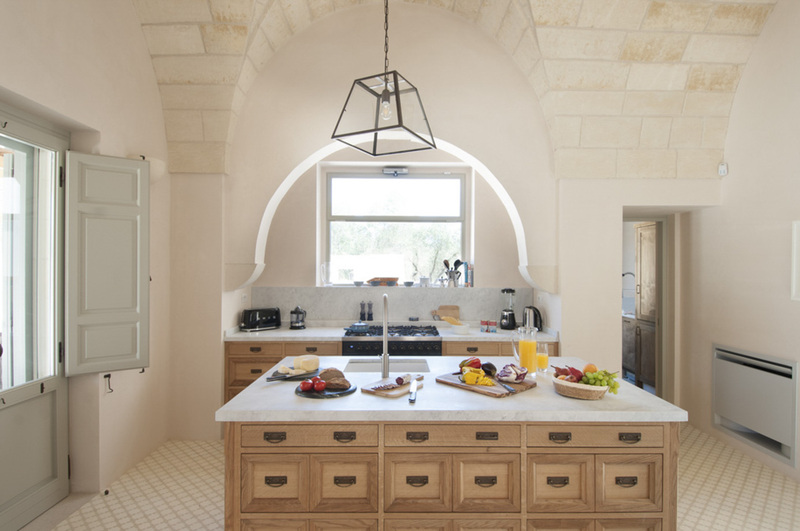 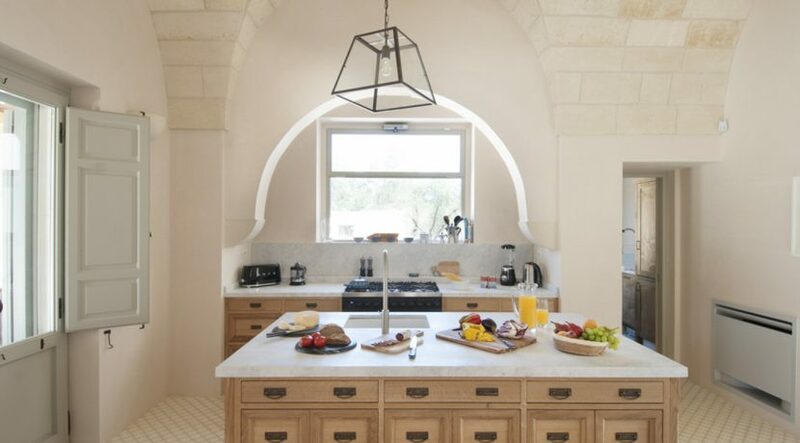 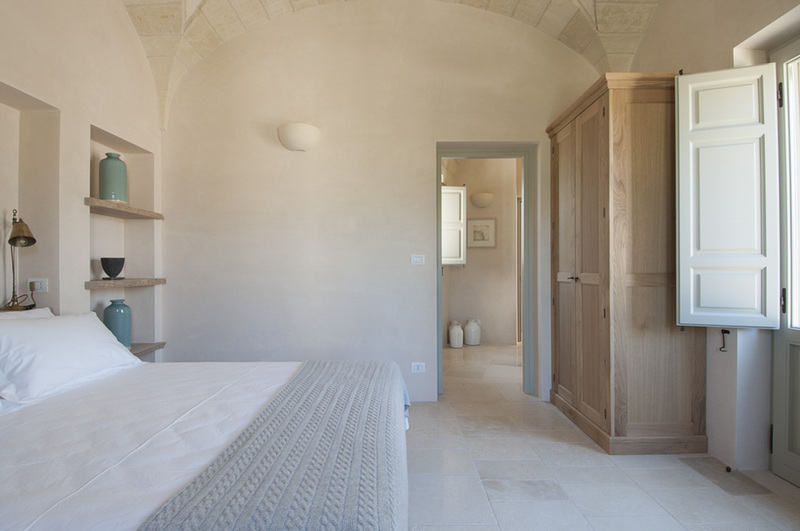 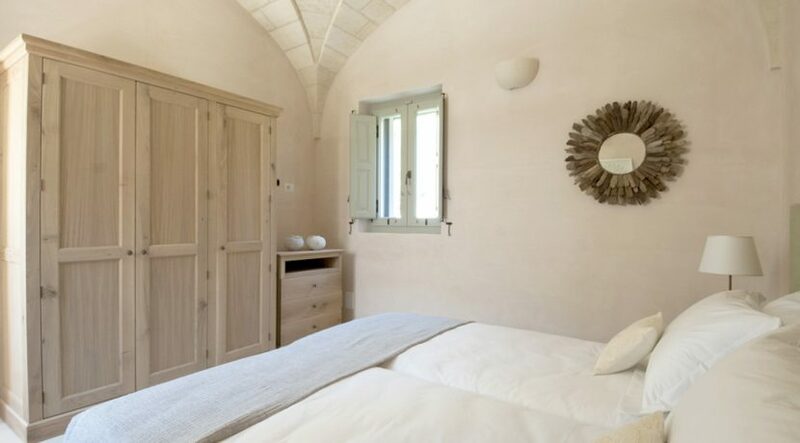 The vaulted ceilings, the local Pietra Leccese and the typical enclosure of rough stones, called “a secco”, are examples of the use of traditional centuries-old craftsmanship. The main garden is dominated by the magnificent infinity pool, surrounded by an enchanting Mediterranean garden and an exquisite courtyard paved with colourful cement tiles, gifted with an outdoor fireplace. 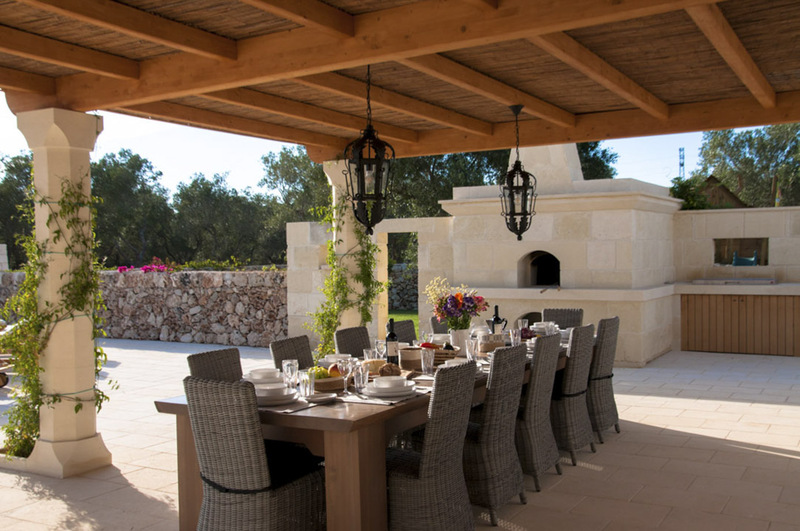 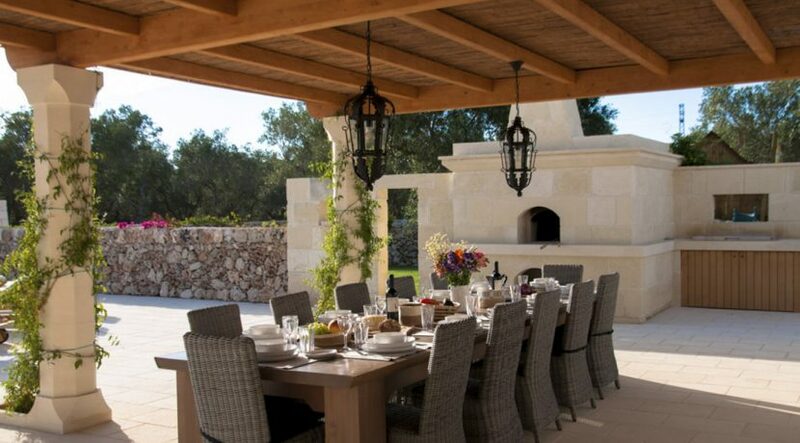 By the pool, under an elegant porch, there is the BBQ, the traditional stone pizza oven and the pleasant ‘al fresco’ dining area. Behind the pergola, it’s the playground on an enclosed lawn where kids may have fun on the wooden house, the slide and the seesaw. 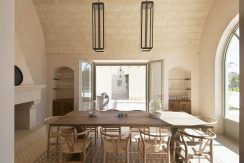 The interconnected courtyards will lead you through the various spaces creating a solid and empty contrast that allow to feel immersed in light and nature. 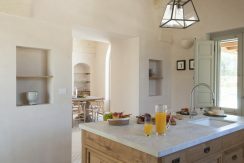 Inside, the well-furnished utility and kitchen are connected to the dining room with pool view. The living room is just a few step away, connected by an open air squared atrium with a majestic stone fireplace with the living room with its library and TV with SKY box is the ideal place where to relax and enjoy a spectacular view on the garden and pool. 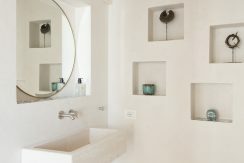 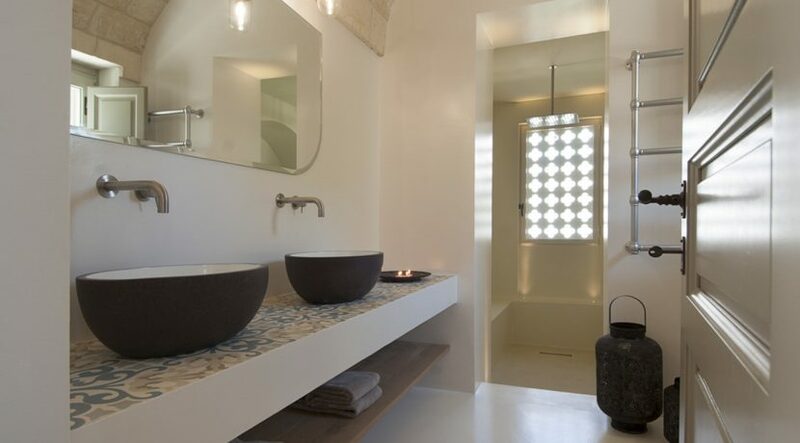 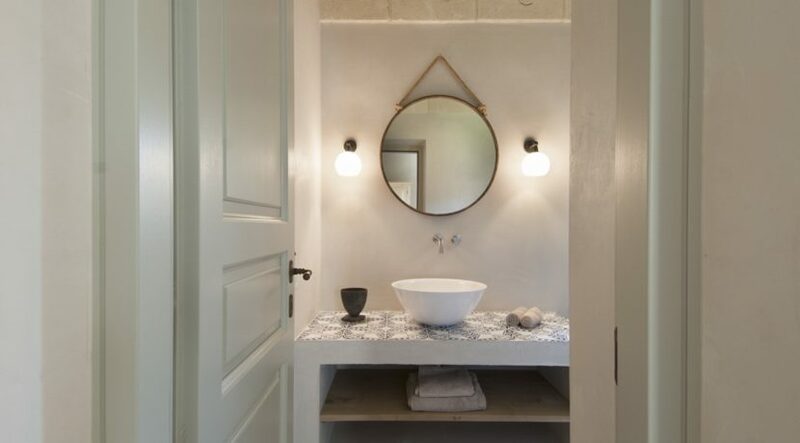 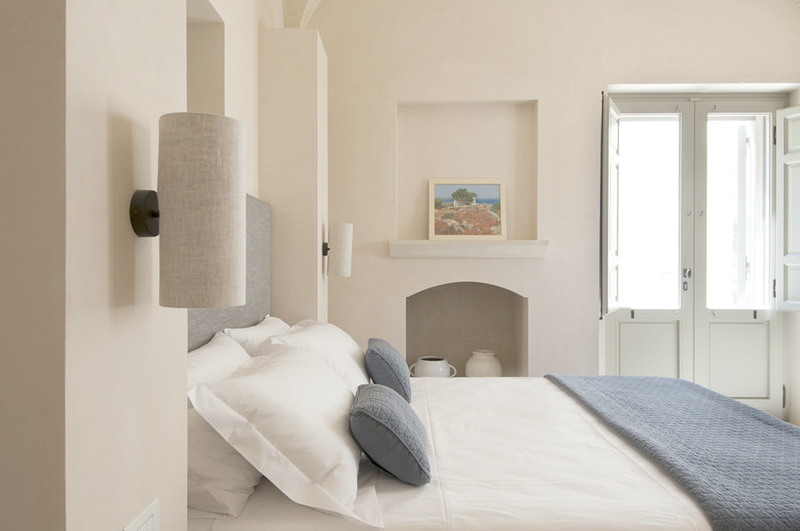 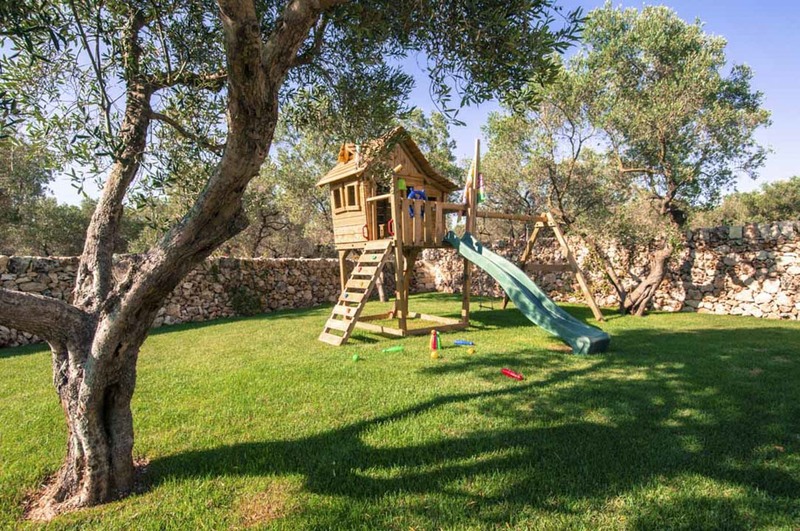 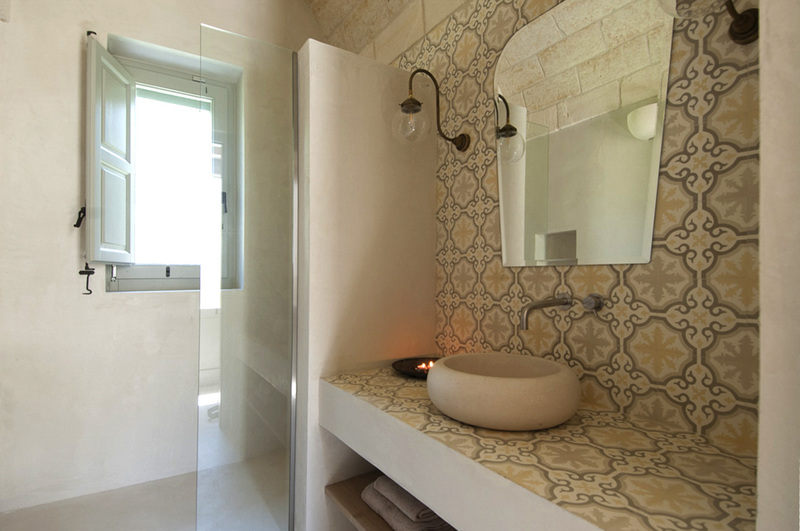 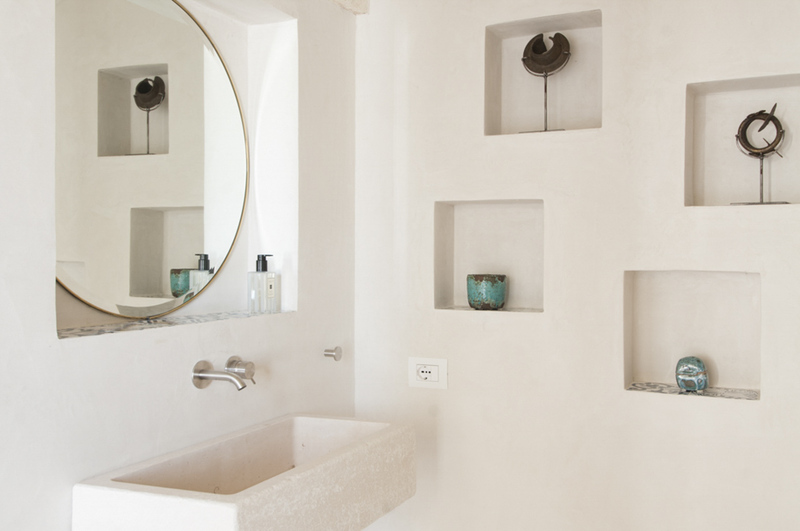 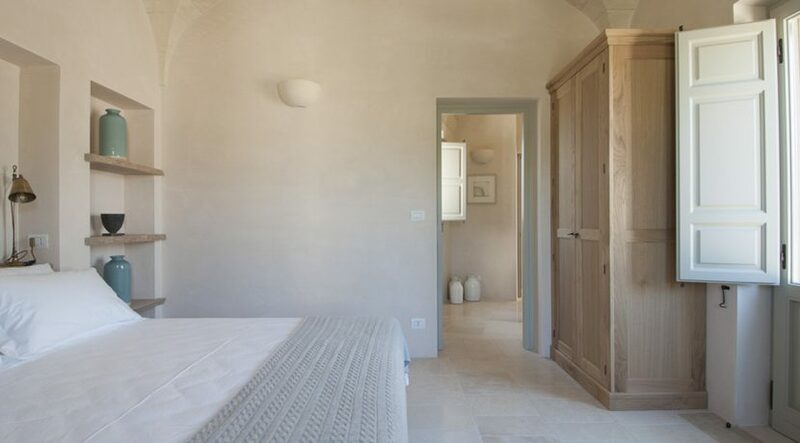 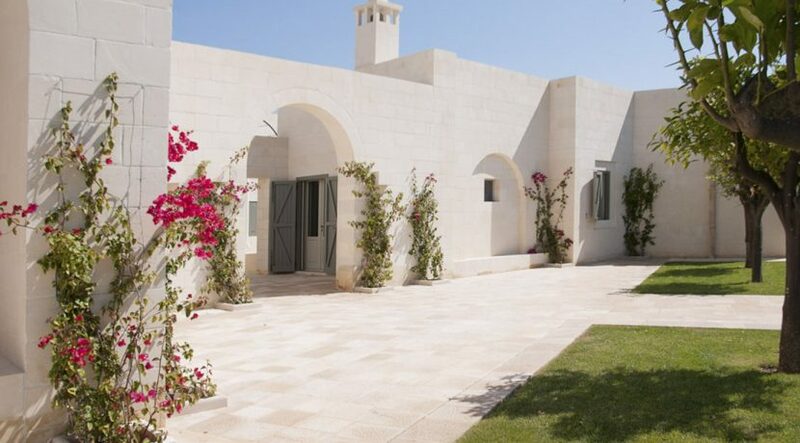 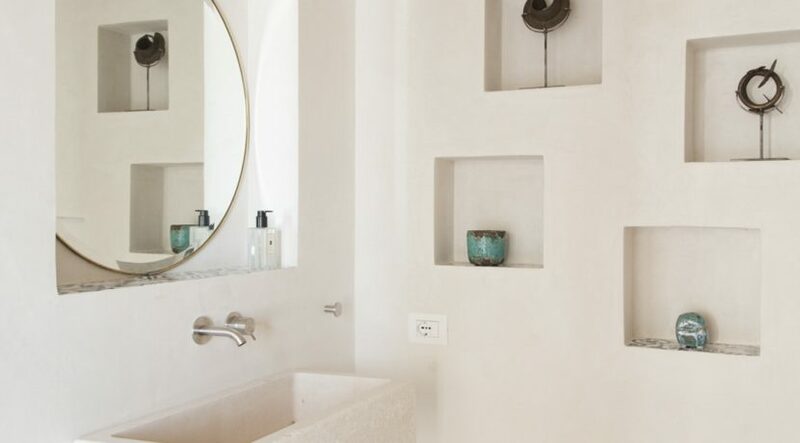 The villa has six bedrooms and can accommodate comfortably up to 12 people. 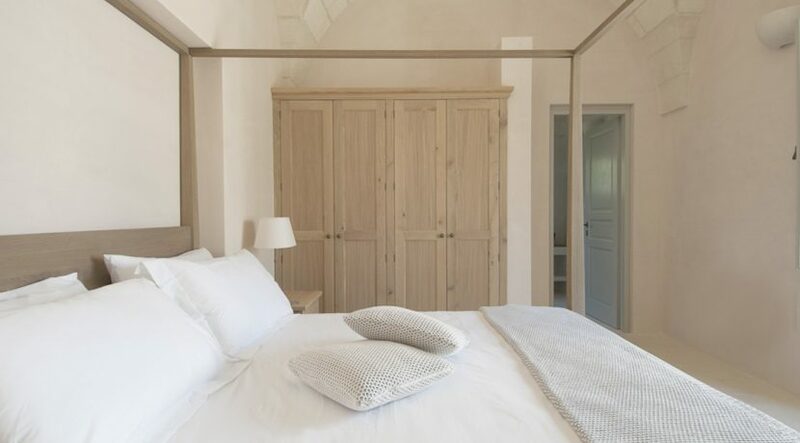 In the separate and private sleeping area, there is the en-suite Master bedroom with Jacuzzi two double bedrooms with sharing shower room connected by a corridor, a double bedroom with en-suite bathroom and two further double bedrooms with ensuite shower rooms in a separate annex. 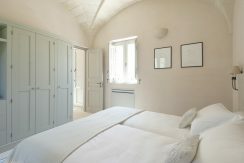 All the bedrooms are surrounded by green English grass with dry stone walls and lemon, oranges, pomegranate and other fruit trees. 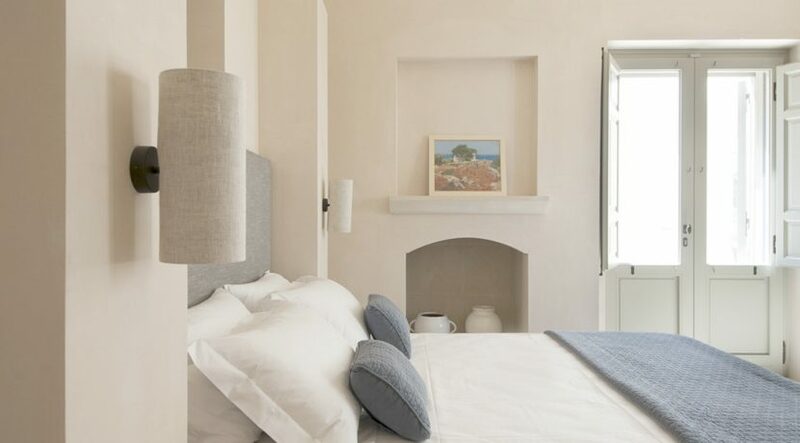 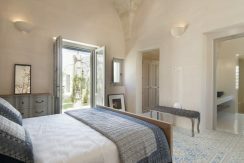 Campo dei Fiori is provided with alarm system, air conditioning, TV in four of the bedrooms – including the master bedroom – and Wi-Fi in all rooms and also by the pool area. 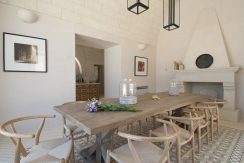 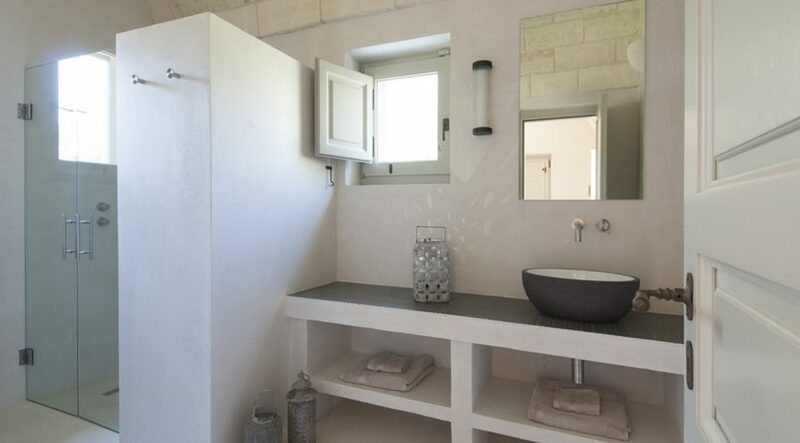 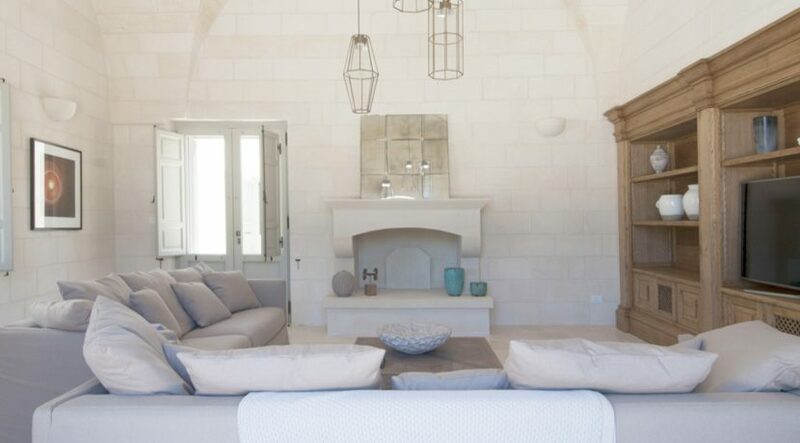 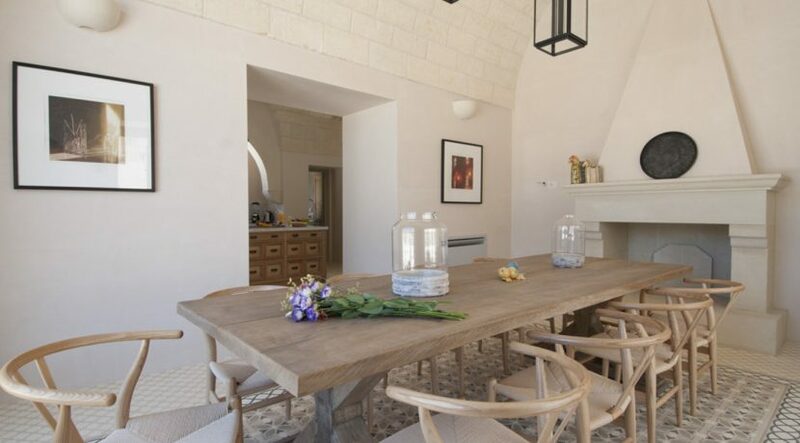 The villa is only 2 Km away from the closest village (Carpignano Salentino) well served with restaurants, cafeterias, shops and pharmacy and 10 minutes’ drive from the beach and Otranto (UNESCO world heritage). 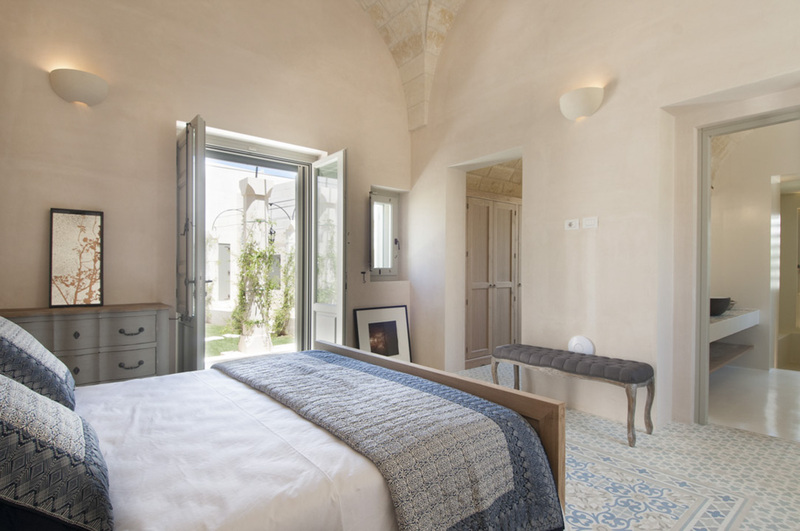 The charming historical centres of Lecce (often referred to as “the Florence of the South”, because of its spectacular baroque style), Galatina, Maglie and Gallipoli are less than half an hour drive and host many interesting events and festivals, celebrating Salento and Puglia traditions, food, music and culture.